1. Crush garlic, and dice 1 onion, 1 red pepper and a couple celery stalks. 2. Toss these elements into a big pot with some margarine in the bottom. Add a little salt if you want, helps release the water inside the vegetables. 3. Let it cook for 5 minutes. 4. Put in 1 can of diced tomatoes. 6. Let it simmer for 15-20 minutes. 7. Add in 1 can of mixed beans, 1/2 can of black beans (if they aren't in your mixed beans), and 1/2 can of corn. 8. Simmer for 20 more minutes. 9. I recommend letting it sit/simmer off the heat for a bit with the lid on. This will give the flavours a chance to blend and mingle, and get all happy. 10. Top with shredded cheese and green onion if you wish. 11. 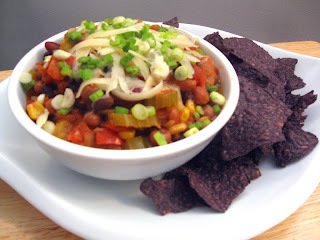 Serve with blue corn tortilla chips... and sour cream! My favourite!